Arizona based AJ’s Garage Door Service of Oro Valley recently uploaded a new video on their YouTube channel introducing their wide variety of garage door services to homeowners of Oro Valley, Marana, Saddlebrooke, and the greater Tucson area. “Garage door problems always seem to happen at the most inconvenient times. The last thing you want to do is to leave what is often the home’s main entrance either stuck open or locked shut, unable to use it. 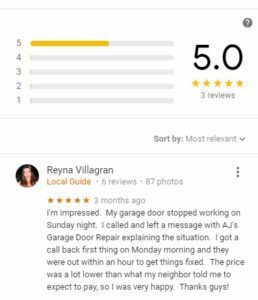 If you need a garage door repair and if you’re in Tucson’s north west area, you can be sure that a technician from AJ’s is nearby and able to get to you quickly,” says Jennifer Banks from AJ’s Garage Door Service of Oro Valley. As noted on the company’s website, AJ’s specializes in a number of garage door services, including full service garage door maintenance, broken overhead garage door springs repair, and replacement of garage door openers. Banks also points out that their technicians are capable of replacing broken garage door cables, worn-out or broken rollers, misaligned or off-track doors and torsion spring replacement, among others. “Our technicians are capable of inspecting and replacing any part of garage doors from springs, brackets, panel hinges, and more. We ensure that all the mechanical pieces work well together, putting less stress on the opener for a smoother and quieter operation,” says Banks. The company even handles the replacement and installation of garage door openers. Not exactly an “infomercial”… but we’re pleased with it nonetheless. Meanwhile, she also points out that garage door repair is not a DIY project because there are a lot of mechanical components that need to be considered. “Trying to replace garage door springs yourself is not something people should try. You need to consider that these springs are designed to open and close doors that can weigh over 400 lbs, and trying to mess with them can be very dangerous,” she said. Moreover, she explains that it is important to hire a highly-skilled professional because they know what to do, and they have the proper tools and equipment to replace garage door parts safely and efficiently. Banks noted that being a locally owned business in AZ, the company’s primary goal is to provide the community with reliable and quality garage door services as well as excellent customer service and prompt technical support. “We understand that having a broken garage door is a stressful situation to be in; that’s why we strive to provide our customers with fast response and dependable services, all at an affordable price” she said. Those in need of garage door repair and other related services may reach out to AJ’s garage door repair of Oro Valley by calling their office hotline. In addition to their more than 10 years of experience in the business, they are also considered one of the leading service providers in the area based on positive reviews and recommendations received online. More information about AJ’s can be found on their website. Clients may also call their Oro Valley office to get a free assessment and price estimate. They provide same day service on all makes and models of garage doors, including Clopay, Martin Garage Doors, Wayne Dalton, Overhead Door, Amarr, Raynor, Liftmaster, and more. Furthermore, interested parties may connect with them through their official social media pages on Facebook and Twitter to learn more about their latest news and important announcements.